YouTube has increased the video upload limit from 10 minutes to 15 minutes. Till last week, you could only upload videos upto 10 minutes, but now the limit has been increased to 15 minutes. Back in 2006, YouTube had limited this to only to 10 minutes because people had started uploading full length movies on YouTube. So to avoid indirectly encouraging piracy, YouTube had earlier limited it to 10 minutes. Why has YouTube increased the video length limit now ? If you want to upload videos more than 15 minutes, then you can contact YouTube partners program. 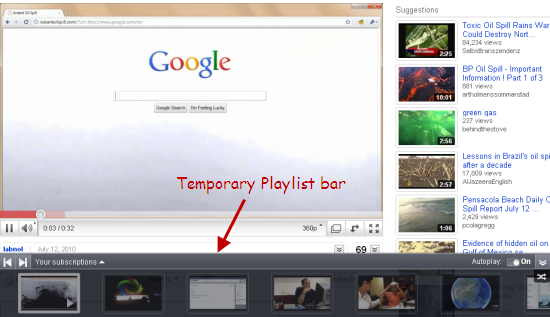 YouTube now also has a new Playlist bar. When ever you look into your subscription videos, YouTube now shows a temporary dynamic playlist bar at the bottom. When you move your mouse over it, it will show the next coming videos from the subscription. You can add videos to the queue and enjoy watching. Do subscribe to our updates to know the latest happenings around the web: RSS | Twitter | Facebook.